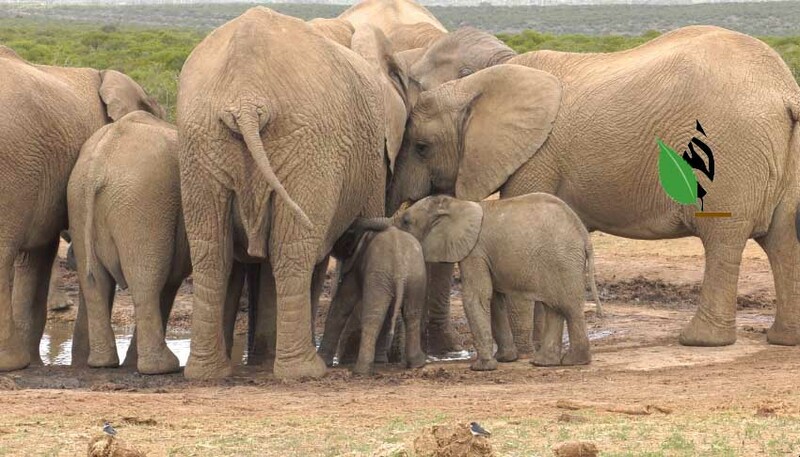 Johannesburg – The proposal that CITES should change the status of the African elephant by placing the species on the (endangered) Appendix I list, has no validity. As long as the southern African elephant populations remain numerous, fecund and excessive, this species cannot be classified as “endangered”. Nor is it facing extinction. This warning by Ron Thomson, CEO of the True Green Alliance (TGA), follows on the announcement by Botswana President Ian Khama during the CITES COP17 in Johannesburg, South Africa, that his country would not support its southern African neighbours’ bids to allow the regulated sales of ivory. “These large numbers of elephants have been consistently over-utilising their habitat resources for the last four decades and more. Consequently, for a very long time, they have been causing a perpetual and progressive degradation of their sanctuaries’ biological diversities; and they have been converting their habitats into deserts. This state of affairs is unacceptable, unsustainable and a recipe for disaster,” Thomson reiterates. Thomson accuses President Khama of satisfying his own parochial needs while ignoring the needs of the very people he pledged to serve. During the last week of September, a delegation of northern district councillors in Botswana called for a high level meeting with the government minister for wildlife affairs, Tshekedi Khama (the president’s brother) to lift the ban on big game trophy hunting in Botswana (according to the Ngami Times). This move demonstrates the dissatisfaction among the people of Botswana with the current state of affairs. “This is indicative of the problem that faces Africa – and the responses that can be expected – when first world nations continue to arrogantly dictate to African states what they can and cannot do with their own wildlife resources”, Thomson says. Thomson says there is growing dissatisfaction among many of the sovereign state members about the manner in which the animal rightist NGOs at CITES seem to be gaining ever more control over the convention’s purpose and decisions. These members blame the animal rightists for the convention’s continual drift away from its primary purpose – which is to regulate the wildlife trade towards the total prohibition of trade. Thomson said those southern African countries that want to reopen the trade in ivory and that have demonstrated that they have properly managed their elephant populations are being penalised unjustly, because other African countries’ governance is so bad that they cannot control poaching and allowed their elephant populations to decline. Thomson warns that CITES will disintegrate and all its fine potential will be lost to civilisation if its secretariat does not address these problems in a fair and equitable manner and remove the participation of the accredited animal rightists NGOs at CITES. I agree with the fact that elephants should not be placed on the “endangered” list in Southern African range states. There is no need for this action, even as a precautionary measure. It i also true that there are a great many NGO’s out there that have no background in ecology and wildlife management across large landscapes, and these organizations should not influence decision making at any level, but merely be part of the process. However, there are also a number of issues with the above article. Mr Thompson speaks about a recipe for disaster. What disaster is he referring to? Elephants have historically existed in very high numbers across Africa, and their impacts mitigated by freedom of movements, seasonally, annually and over long-term cycles. The variability in elephant impacts in the ecosystem and biodiversity has been shown over and over again to b far more complex than stated in this article. Elephants are also agents of seed dispersal, ecosystem engineers and an integral part of the continents megafauna. And they have been for centuries. So why is there a sudden call of distress and disaster because of 300,000 elephants in 5-6 different countries? Modern ecologists understand that “carrying capacities” are dynamic and ever changing. They are influence by rainfall, temperatures, resource abundance, competition, predation and numerous other factors, instead of being a static concept that many claim. While there is some evidence to support that elephants (when movement is restricted by fences) do adversely impact on some levels of biodiversity, there is little evidence to support this for free-roaming individuals, such as the herds in parts of Namibia, Botswana, Angola, Zambia and Zimbabwe. In fact, on the contrary, the presence of free-roaming elephants across the landscape allows them to perform their function as agents of change, creating habitats for other species and shaping the landscape as they have always done. It is to see animals moving around in their natural habitat and in a natural manner that tourists flock to southern Africa. Doomsday comments and articles about how detrimental elephants are in these countries will not be doing tourism or science any favours. Conflict is inevitable where humans and wildlife co-occur, in the same way accidents are an inevitable part of driving. And this conflict is driven by our desire to have the land for ourselves, for agriculture or development or to “sustainably use” wildlife for the benefit of man. What we need to do is manage conflict accordingly, addressing the root causes rather than blaming increasing animal numbers (which are far lower now than they have been historically). Issues such as green schemes in elephant corridors are the real recipe for disaster. Crop farming adjacent to natural wildlife habitats i.e. conflicting land use is another huge problem that Land, Agriculture and Environmental ministries are failing to address. If bans on trophy hunting are affecting income in certain areas, this must be reviewed and overturned if necessary. CITES need to evolve into the new era of conservation themselves, and actually start playing a pro-active role, as currently they are as responsible for many of these issues as the people on the ground. NGO’s (both Animal-rights Pro and others) need to share their knowledge and opinions in a constructive and evidence based approach, as do governments and groups like TGA. Claims that elephants turn habitat to desert and are degrading their habitats over the last four decades are dangerous and unsubstantiated and can do a great deal of harm if not contextualized properly, they are specific to certain situations and in other instances, elephants can also promote woodland and forest regeneration. It is humanity that has forced these animal into corners and pockets thereby increasing the impact they have locally. I completely disagree that NGOs and animal rights groups should be removed from CITES. They have an important role to play, even though a lot of their focus is misdirected and some of their information not credible. It will take a combined and consolidated effort from all range states, relevant stakeholders and organizations, and communities on the ground to ensure that conservation is truly sustainable moving into the future. (1). Modern day ecologists have forgotten, it seems, that the primary management objective of a national park is to preserve the sanctuary’s biological diversity. In my day, I was taught, that nothing is more important. THAT has not changed! And maintaining excessive elephant populations in Africa’s wildlife sanctuaries for long periods of time decimate the habitats; and critical habitats for many animal species disappear; and those animal species become locally extinct. And THAT is the “disaster” to which I refer… potentially massive loss of species diversity. (2). How can elephants be agents of (tree) seed dispersal when there are no trees left to produce seeds? (3). I see you don’t want to discuss the principle that, in biological and management terms, there is no such thing as an “endangered species”. That concept fits in nowhere in the science of wildlife management. (3). Many modern ecologists need to start thinking about the old principle of managing for ecosystem health and security; rather than looking towards single species management (such as for elephants). But so long as they think the elephant is the most important species in our ecosystems – and its management (or lack of it) is all important – we have to consider just how many elephants an ecosystem can hold without damaging the habitats (and that means, we are forced to consider a game reserve’s elephant carrying capacity)… because once they start damaging the habitats they adversely affect species diversity and ecosystem sustainability. (4). Today we have to live with the reality of the human presence (in ever increasing numbers) in all our wild environments; and we need to learn to project just what their impact is going to be on our wildlife by (for example) the end of this century. Today there are some 750 million people living in Africa south of the Sahara desert – and already man and wildlife are having difficulty living in harmony together! By the end of this century there are going to be over 4 billion people living in this same region of Africa. And somewhere in Africa – within this gigantic mass of humans and wild animals – both man and wildlife are going to have to find places in the sun to live. And unless wildlife can contribute to man’s survival by the year 2100, mankind will replace our wildlife with domestic animals which WILL help him to survive. So, no matter HOW elephants roamed freely over Africa in years gone by, those days are gone forever. Certainly they will be completely “gone” by the year 2100. So we cannot continue to wallow in bucket-list beliefs and desires – because they are gone forever, too. We have to learn to live with reality. And we cannot, and must not, accept the fact that “there is some evidence to support (the view) that elephants (when movement is restricted by fences) do adversely impact on some levels of biological diversity” BUT that “there is little evidence to support this for free ranging elephants” – because, by the end of this century it is probable that there will be NO “free-ranging elephants” anywhere in Africa. And those that exist in those days will most probably ALL be maintained behind fences. So the above argument will not be anywhere valid by the end of this century – and THAT is the time we have to start managing for NOW. (5). If your concern is centred on what the tourists want (with regard to elephants) then, with all due respect, you should not be in the wildlife management business; you should transfer to tourism. Tourism is something that can (and should) be imposed on well-managed ecosystems in such a way that the tourism infrastructures and tourism impact do no impinge on the primary purposes of our national parks – which is biodiversity maintenance and general wildlife management. (6). If you believe that agriculture should be subjugate to wildlife ‘conservation’ – in the face of Africa’s burgeoning human population – NONE of your wildlife management objectives will ever be attained. Man comes first in this world. And man – especially poverty stricken and unemployed man – will be the factor that either makes or breaks the wildlife scene in Africa in the long run. Forget about your green schemes in elephant corridors. In another 50 years there will no elephant corridors because elephants will by then be confined behind game fences. What we need to do – and desperately quickly – is to find a way to integrate the needs of man with the needs of wildlife – so to make it possible for both to live in symbiotic harmony together, forever. Read “The IUCN’s World Conservation Strategy (1980)”. It will teach you more about finding solutions to African wildlife problems in the future than any PhD course will ever do. (7). Your perception of CITES, and of the animal rightists’ involvement in CITES, is so naïve that it is revealing. Your statement that NGOs (both animal rightists pro and others) “need to share their knowledge and opinions in a constructive and evidence-based approach as do governments and groups like TGA” is equally revealing. You obviously have no idea that the animal rights brigade is a confidence industry – pure and simple. Animal rights NGOs are not “in it” to help wild animals. They are “in it” to make money from the gullible publics of the First World. And it has been shown that NONE of them are prepared to discuss “their knowledge and opinions in a constructive and evidence-based approach.” If they did THAT they would be cutting their financial throats. In their propaganda they actually invent lies for the purpose of conditioning the general public towards emotional hysteria – and thereby to get them to donate money. So, very often, they deal with NO “FACTS” at all. In the last two paragraphs of your complaint, your naïveté about the animal rights movement “says it all”. 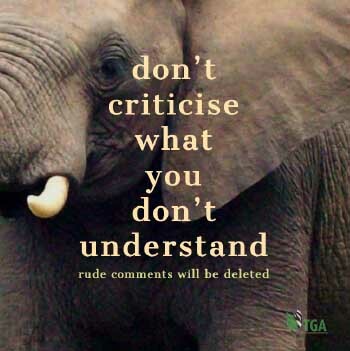 Please, for the sake of Africa’s wildlife – and your own credibility – learn about the issues that you find so much fault with in others.